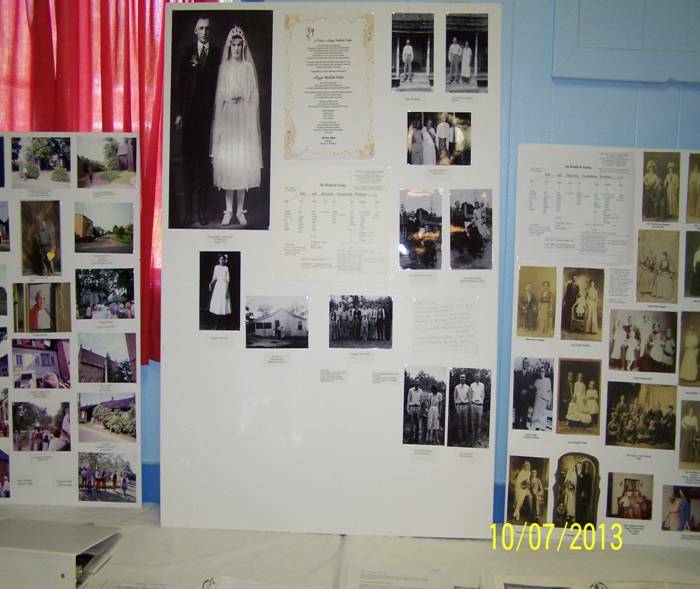 Celebrating the 18th Anniversary of the Yanchak Family Reunion, family members gathered, once again, on Sunday, October 6, at the Knights of Columbus Hall in Anderson – for a day of remembering and commemorating our ancestors who have left us such an awesome legacy. 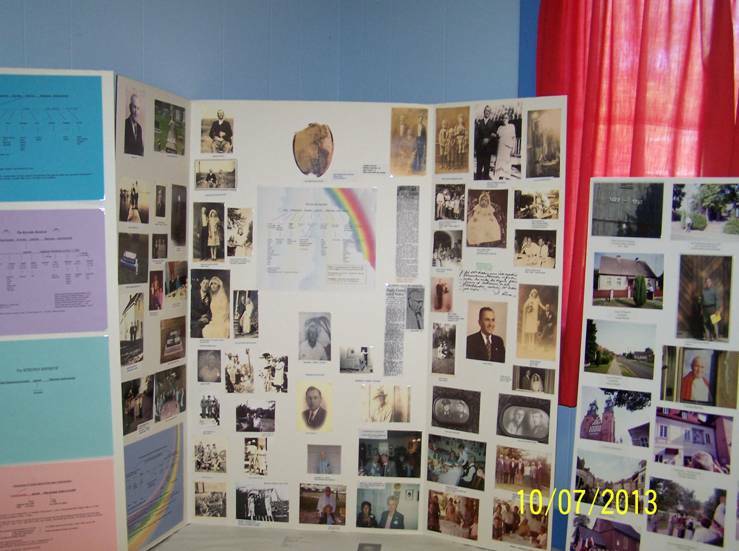 Those gathering for this special event enjoyed a multi-faceted family reunion, as we continue to search, discover and rediscover the connections within the various family lines of the Yanchak, Gorney, Kapalski, Klodzinski, Kubiak, Koronka, Wrobleski and Kolojajck-Kolojaco lines – that interweave and intermingle in creating our Family Tree. Coming back to Anderson – where our Polish roots were deeply planted over 100 years ago – is a joyous occasion for all present – as we continue to nurture, cherish and cultivate those roots planted so long ago, and, in the process, we encourage and help our young family members to grow in this love of our heritage. Celebrating in the theme of God’s creation, Red birds and nests nestled in beautiful floral arrangements of red and white flowers and red and white berries graced the beautiful white tablecloths and latte linen table runners and the altar. The beautiful floral arrangements were created by decorating coordinator, Shirley Machacek. Highlights of our wonderful day included a Remembrance Prayer Service conducted by Eric Adam of San Antonio. 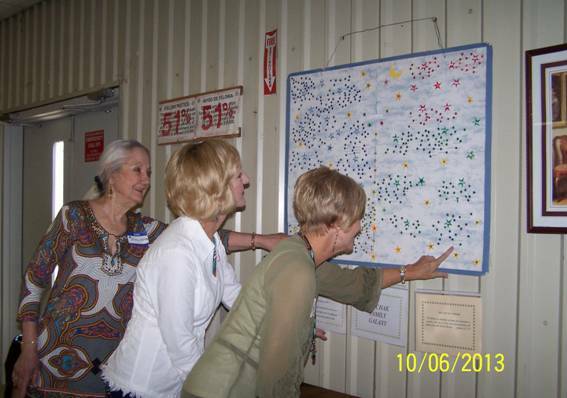 A special dedication, “We Remember Them” was offered by Marie Yanchak; Magnolia; A Reading from the Book of Sirach, “In Praise of our Ancestors” was read by Gail Greenberg, Brazoria. Remembrance Candles were lit as we remembered each Family Line and milestone anniversaries. Teresa Bystry recited a Polish Prayer read from Busha Catharine Koronka’s Old Polish Prayer Book – and Teresa led us in the Polish Greeting and the Blessing was also recited in Polish. 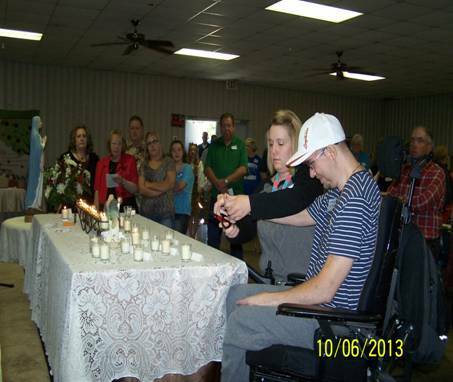 Family members participated in lighting candles for loved ones who have passed away since our last Reunion. 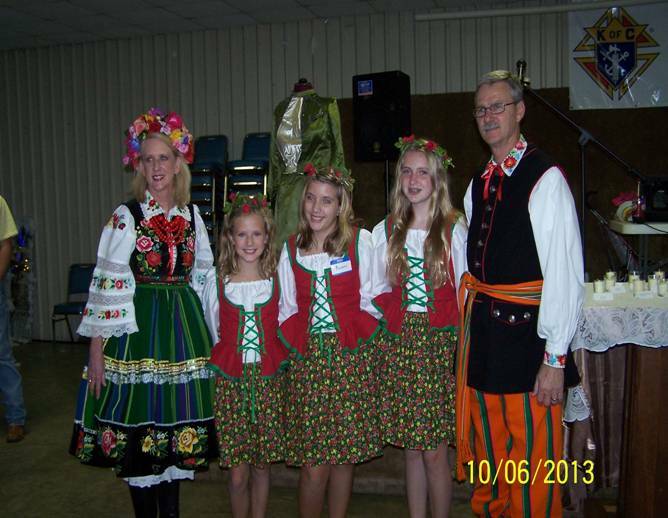 Wearing beautiful Polish Outfits designed by Marcia Linton, Jessica Temborius, Hannah Payne and Rachel Reinbolt led the children in the Crowning of the Blessed Mother. Taylor Weidner also joined them in serving as Greeters. 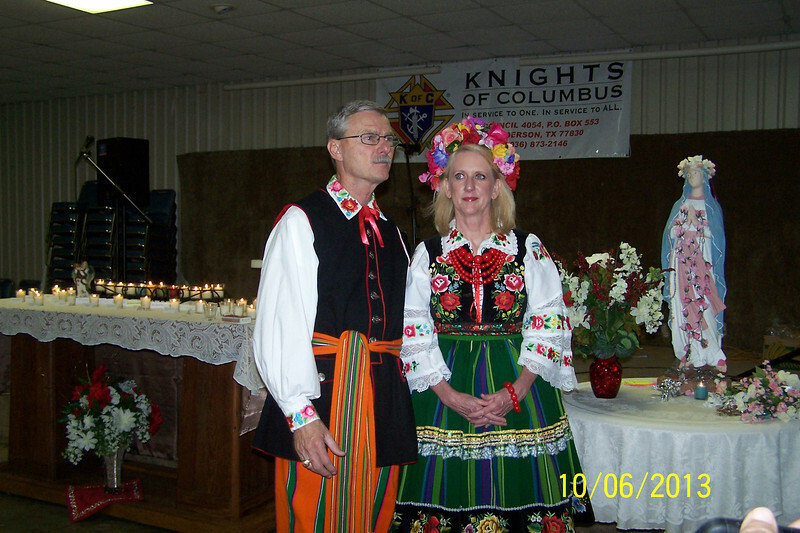 Adding to the spirit of the day, Dr. Jim and Kathy Mazurkiewicz – to the surprise and delight of all present – appeared in their beautiful Polish Wedding attire – a gift presented to them in Poland where they celebrated their 35th Anniversary this summer. Dr. Jim brought his concertina, and, along with his son, James, provided wonderful Polish music to the delight of all present. 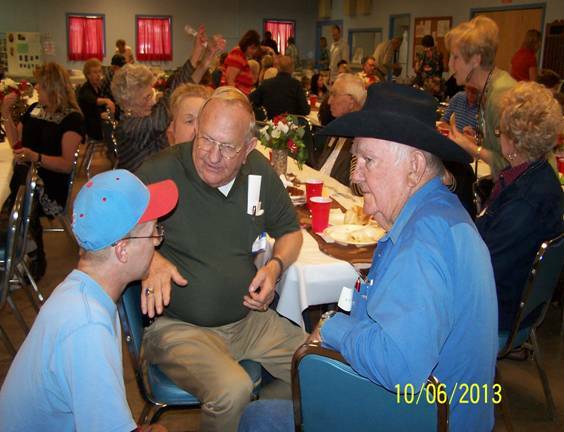 The Traditional trademark Covered-Dish Luncheon was enjoyed by all. The delicious Pieorgi prepared by Eugene and Janette Yanchak added to the celebration of our Polish traditions. The traditional raffle concluded the afternoon’s activities. Wendish noodles were offered as door prizes. 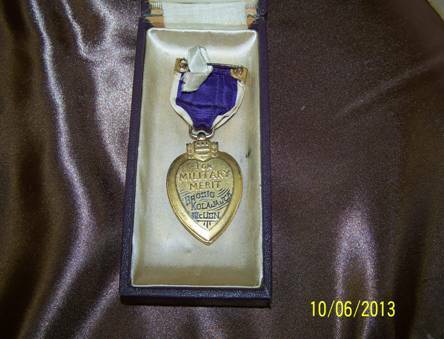 New additions to our Exhibit tables included an extension of our Family Military Tribute ~ New exhibits of the Wrobelski and Kolojajck-Kolojaco families were displayed – and Marion Busa shared the Purple Heart that was awarded to Brosig Kolojajck, who was killed at Pearl Harbor. Many new family connections were made during the course of the day. 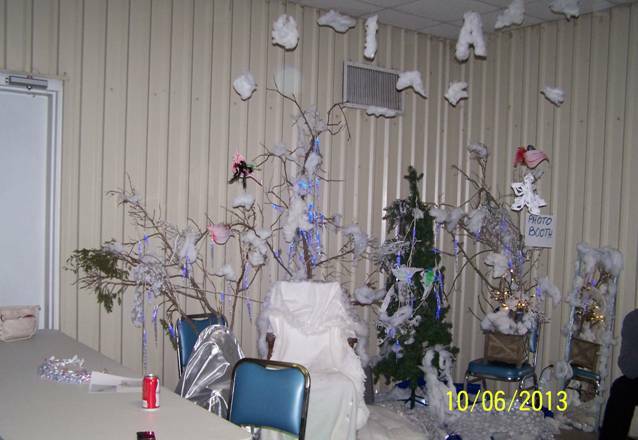 Teresa Bystry created a “Zima – Winter in Poland” creative corner for the children. A photo booth was available for pictures in a Polish Winter Scene. 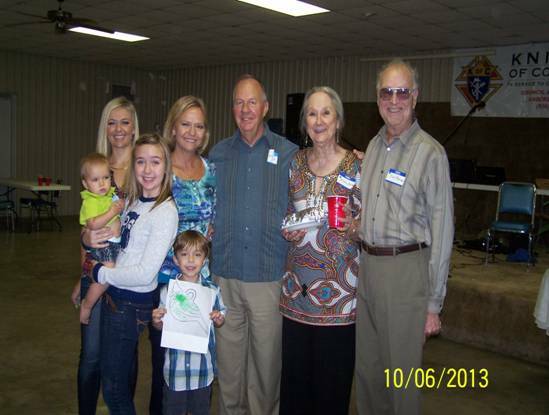 The next reunion will be held on Oct. 5, 2014 when we will once again gather to celebrate our faith and our family and our Polish culture and to nurture our Polish roots that were deeply planted over a century ago in a little town called Anderson. 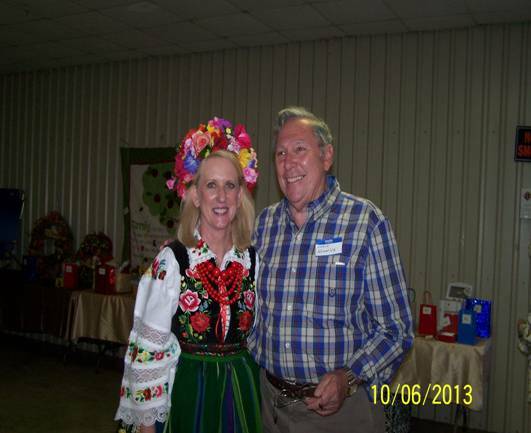 Dr. Jim and Kathy Mazurkiewicz; Bryan; in their beautiful Polish Wedding costumes - at the Yanchak Family Reunion - Dr. Mazurkiewicz is Regents Fellow, Professor and Leadership Program Director Texas A&M AgriLife Extension Service Department of Agricultural Leadership, Education & Communications. Jessica Temborius, Hannah Payne and Rachel Reinbolt with Dr. Jim and Kathy Mazurkiewicz - Behind them on display is their Great-Great Grandma Pearl Klodzinski’s beautiful Wedding Dress.